Posts tagged " Tax Rates "
On November 9, 2017, the Senate Finance Committee released its proposal for tax reform. It varies from the House of Representatives proposal in a number of ways. We will be discussing those differences over the next several posts, but will be starting with the tax rates. There are currently 7 ordinary income tax brackets. For single individuals in 2018, your first $9,525 of income is taxed at a 10% rate. A 15% rate applies to your income over $9,525 to $38,700. The 25% tax bracket applies to your income over $38,700 to $93,700. Your income over $93,700 to $195,450 is taxed at a 28% rate. A 33% rate applies to your income over $195,450 to $424,950. Your income over $424,950 to $426,700 is taxed at a 35% rate. All of your income over $426,700 is taxed at a 39.6% rate. For married couples choosing to file a joint tax return, your first $19,050 is taxed at a 10% rate. A 15% rate applies to your income over $19,050 to $77,400. The 25% tax bracket applies to your income over $77,400 to $156,150 is taxed at a 25% rate. Your income over $156,150 to $237,950 is taxed at a 28% rate. A 33% rate applies to your income over $237,950 to $424,950 . Your income over $424,950 to $480,050 is taxed at a 35% rate. All of your income over $480,050 is taxed at a 39.6% rate. You may expect that the married filing jointly tax brackets would be exactly double the single tax bracket. However, once you get to the 28% tax bracket you will notice that is not true. This is what is known as the marriage penalty. There would be 7 ordinary income tax brackets under the Senate proposal. For single individuals, your first $9,525 of income is taxed at a 10% rate. A 12% rate applies to your income over $9,525 to $38,700. From over $38,700 to $60,000 your income is taxed at a 22.5% rate. The 25% tax bracket applies to your income over $60,000 to $170,000. A 32.5% rate applies to your income over $170,000 to $200,000. Your income over $200,000 to $500,000 is taxed at a 35% rate. At $500,000 and above your income is taxed at a 38.5% rate. For married couples choosing to file a joint tax return, your first $19,050 of income is taxed at a 10% rate. A 12% rate applies to your income over $19,050 to $77,400. From over 77,400 to $120,000 your income is taxed at a 22.5% rate. The 25% tax bracket applies to your income over $120,000 to $290,000. A 32.5% rate applies to your income over $290,000 to $390,000. Your income over $390,000 to $1 million is taxed at a 35% rate. At $1 million and above your income is taxed at a 38.5% rate. As you may have noticed, the Senate proposal preserves the marriage penalty, but only for the 32.5% and 35% tax brackets. There would be 4 ordinary income tax brackets under the House of Representatives proposal. For single individuals, your first $44,999 of income is taxed at a 12% rate. Your income from $45,000 to $199,999 is taxed at a 25% rate. A 35% rate applies to your income from $200,000 to $499,999. At $500,000 and above your income is taxed at 39.6% rate. For married couples choosing to file a joint tax return, your first $89,999 of income is taxed at a 12% rate. Your income from $90,000 to $259,999 is taxed at a 25% rate. A 35% rate applies toy our income from $260,000 to $999,999. At $1 million and above your income is taxed at a 39.6% rate. The House of Representatives also maintain the marriage penalty for the 35% tax bracket. Currently, there are 3 tax rates that apply to capital gains (0%, 15%, and 20%). In 2018, the 0% tax rate applies if your taxable income is $38,700 if you are single and $77,400 if you are married filing a joint tax return. The 15% tax rate applies if your taxable income is between $38,701 and $426,700 if you are single and $77,401 and $480,050 if you are married filing a joint tax return. The 20% tax rate applies if your taxable income is above those thresholds. The House and Senate proposals would maintain the same three capital gains rate (0%, 15%, and 20%). They would also have the rates apply to the same income limits even though they are changing the underlying tax brackets. In our next post, we will discuss the Senate’s new deduction for business income, as well as their proposed changes to the standard deduction, itemized deductions, and AMT. 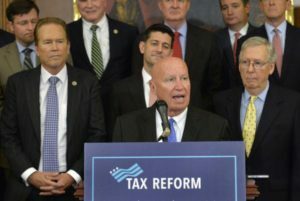 In the past 3 posts in our series, we discussed how the House of Representative’s tax reform bill would change individuals’ tax rates, amount of taxable income, and their tax credits. Now, we are going to illustrate how all those changes come together and could affect you. Justin is single and works as a teacher in San Diego earning a $50,000 salary. Every year, he spends at least $250 on supplies for his classroom. Justin is renting an apartment with friends. Under the current tax system (with 2016 tax rates), Justin would owe $5,628 in federal taxes. This is because he had $50,000 in adjusted gross income and is able to deduct up to $250 as educator expenses. His standard deduction of $6,300 is greater than his almost non-existent itemized deductions, and his personal exemption is $4,050. That means his taxable income is $39,400, and he is in the 25% marginal tax bracket. Under the tax reform proposal, Justin would owe $4,536 in federal taxes. He still has $50,000 of income, but he is no longer entitled to the educator expense deduction. His standard deduction is now $12,200 but he does not have a personal exemption. His taxable income is $37,800, and he is in the 12% marginal tax bracket. Ryan and Amy are married and both work for the City of San Diego earning a salary of $60,000. Amy also invested into a friend’s business years ago as a passive investor, and has $20,000 of ordinary income per year from that investment. Ryan and Amy own a house, and owe $400,000 on it. They will have to pay mortgage interest of $14,000 and property taxes of $7,000. They made charitable contributions of $2,000. They paid $5,500 of California income taxes during the year. Under the current tax system (with 2016 tax rates), they would owe $17,393 in federal taxes. This is because they have $140,000 in adjusted gross income. They itemized their deductions and are able to deduct a total of $28,500, and have personal exemptions worth $8,100. That means that their taxable income is $103,400, and they are in the 25% marginal tax bracket. Under the tax reform proposal, they would owe $17,200 in federal taxes. They still have $140,000 of adjusted gross income, but now instead of itemizing their deductions they are taking a standard deduction of $24,400 and do not have a personal exemption. Their taxable income is $115,600, and they are in the 25% marginal tax bracket. Tom and Carolyn are married and live in California. Tom is an engineer with an annual salary of $70,000. Carolyn is a doctor who owns her own practice (as a sole proprietorship), and this year she has $300,000 of business income. They own a house and owe $1.2 million on it. They will have to pay mortgage interest of $44,000 and property taxes of $12,000. They made charitable contributions of $10,000. They paid $24,000 of California income taxes during the year. Under the current tax system (with 2016 tax rates), they would owe $85,972 in federal taxes. This is because they would have $362,976 of adjusted gross income ($370,000 of income less a deduction of $7,024 for self-employment taxes). They itemize their deduction and are able to deduct a total of $84,587. That is because their mortgage interest deduction is limited slightly due to the size of the loan, and there is an overall limitation on the amount of itemized deductions they are allowed to take due to their income. They are only entitled to personal exemptions of $4,698 due to income limitations. Their taxable income is $273,480, and would have federal taxes of $68,209, but they are in AMT and therefore owe an additional $5,390 in federal taxes. In addition, due to the amount and nature of their income they would owe $14,048 in self-employment taxes and $873 as a Medicare surtax. They are in the 33% marginal tax bracket. Under the tax reform proposal, they would owe $83,882 in federal taxes. They still have $362,976 of adjusted gross income, and would still be allowed to itemize their deductions. However, because they cannot deduct state taxes or as much mortgage interest, their itemized deduction is only $40,333. They do not have any personal exemptions. Their taxable income is $322,643, and there is no AMT under the tax reform proposal. They would owe $68,981 in federal income taxes, and the same $14,048 in self-employment taxes and $873 as a Medicare surtax. Although their total taxable income would have otherwise pushed them into the 35% tax bracket, because 30% of the business income is taxed at a 25% rate they never left that tax bracket. Frank and Mary are married and live in California. They own a very successful real estate development company together (which is organized as an S-corporation), and will make $800,000 of net profit. They own a house and owe $1 million on it. They will have to pay mortgage interest of $38,000 and property taxes of $15,000. They made charitable contributions of $30,000. They paid $67,000 of California income taxes during the year. Under the current tax system (with 2016 tax rates), they would owe $229,772 in federal taxes. This is because they have $800,000 of adjusted gross income. They itemized their deductions and are able to deduct $135,339 due to a reduction of $14,661 as a result of an overall limitation on the amount of itemized deductions. Due to income limitations, they are not entitled to a personal exemption. Their taxable income is $664,661, and they owe income taxes of $208,872 on that amount. They owe an additional $20,900 as a Medicare surtax. They are in the 39.6% tax bracket. Under the tax reform proposal, they would owe $216,800 in federal taxes. They still have $800,000 of adjusted gross income, and would still be allowed to itemize their deductions. However, because they cannot deduct state taxes or as much mortgage interest, their itemized deduction is only $64,000. There are no personal exemptions. Their taxable income is $736,000. They would owe $190,900 in federal income taxes and the same $20,900 as a Medicare surtax. Although they are in the 35% tax bracket, $240,000 of their business income was still taxed in the 25% tax bracket. 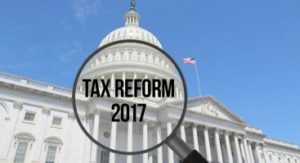 On November 2, 2017, the Republican leadership in the House of Representatives unveiled their tax reform proposal. This tax reform proposal, if enacted, would be the most sweeping piece of tax legislation since 1986. Because the actual bill is over 400 pages long, we will be covering several major aspects of it over several blog posts rather than all at once. If you heard nothing else about the proposed tax reform, you heard that the tax rates that apply to individuals would be decreasing. That is true, although not as straight-forward as it sounds as we will be discussing here and in future posts. Under the proposal, there would be 4 ordinary income tax rates: 12%, 25%, 35%, and 39.6%. For single individuals, the 12% rate applies to your first $44,999 of income. The 25% rate applies when your income is between $45,000 and $199,999. The 35% rate applies when your income is between $200,000 and $499,999. All income above $500,000 is taxed at a 39.6% rate. For married couples filing jointly, the 12% rate applies to your first $89,999 of income. The 25% rate applies when your income is between $90,000 and $259,999. The 35% rate applies when your income is between $260,000 and $999,999. All income above $1 million is taxed at a 39.6% rate. For married couples choosing to file separately, the tax brackets are one-half of the filing jointly tax brackets. While this proposal does not change the current capital gains tax rates (i.e. 0%, 15%, and 20%), it does change the income thresholds at which the various rates apply. For single individuals, the 0% capital gains tax rate applies if your income is less than $38,600. The 15% capital gains rate applies if your income is between $38,600 and 425,799. The 20% capital gains rate applies if your income is $425,800 or above. For married couples filing jointly, the 0% capital gains tax rate applies if your income is less than $77,200. The 15% capital gains rate applies if your income is between $77,200 and $478,999. The 20% capital gains rate applies if your income is $479,000 or above. For married couples filing separately, the 0% capital gains tax rate applies if your income is less than $38,600. The 15% capital gains rate applies if your income is between $38,600 and $239,499. The 20% capital gains rate applies if your income is $239,500 or above. Under the House Republicans proposal, business owners may also benefit from a lower tax rate. Businesses that are operated as a sole proprietorship, partnership, limited liability company (LLC), or an S-corporation currently do not pay federal income taxes themselves, but instead “pass thru” the income and losses to the owners. The owners then pay taxes on that business income at their individual tax rates. Under this proposal, owners of these “pass thru” entities would still report the business income on their individual tax returns, but now may pay a maximum tax rate of 25% on a portion of their business income, if they qualify. All income from passive activities (e.g. a business that you invest in but have no active role in operating) would be taxed at the 25% rate. However, if you are actively operating a business, the government does not want you to disguise your compensation (which may be taxed at a higher rate depending upon what your taxable income is for the year) as business income. Therefore, they apply a formula to determine what percentage of your business income should qualify for the 25% business tax rate. They do allow a safe harbor percentage of 30%, and also allow taxpayers to make a “facts and circumstances” determination rather than using the prescribed formula. However, certain types of businesses do not qualify for the 25% business tax rate. These businesses are those in the fields of: health, law, engineering, architecture, accounting, actuarial science, performing arts, consulting, athletics, financial services, brokerage services, or any business where the principal asset is the reputation or skill of one or more of its employees. These businesses are typically thought of as “personal services” businesses. In the next post, we will be discussing changes to the standard deduction, itemized deductions, and personal exemptions and how those changes will affect your taxable income.